For other uses, see Flora (disambiguation). Flora is the plant life occurring in a particular region or time, generally the naturally occurring or indigenous—native plant life. The corresponding term for animal life is fauna. Flora, fauna and other forms of life such as fungi are collectively referred to as biota. Sometimes bacteria and fungi are also referred to as flora, as in the terms gut flora or skin flora. The word "flora" comes from the Latin name of Flora, the goddess of plants, flowers, and fertility in Roman mythology. The technical term "flora" is then derived from a metonymy of this goddess at the end of the sixteenth century. It was first used in poetry to denote the natural vegetation of an area, but soon also assumed the meaning of a work cataloguing such vegetation. Moreover, "Flora" was used to refer to the flowers of an artificial garden in the seventeenth century. The distinction between vegetation (the general appearance of a community) and flora (the taxonomic composition of a community) was first made by Jules Thurmann (1849). Prior to this, the two terms were used indiscriminately. Weed flora. Traditionally this classification was applied to plants regarded as undesirable, and studied in efforts to control or eradicate them. Today the designation is less often used as a classification of plant life, since it includes three different types of plants: weedy species, invasive species (that may or may not be weedy), and native and introduced non-weedy species that are agriculturally undesirable. Many native plants previously considered weeds have been shown to be beneficial or even necessary to various ecosystems. Simon Paulli's Flora Danica of 1648 is probably the first book titled "Flora" to refer to the plant world of a certain region. It mainly describes medicinal plants growing in Denmark. The Flora Sinensis by the Polish Jesuit Michał Boym is another early example of a book titled "Flora". However, despite its title it covered not only plants, but also some animals of the region, that is China and India. A published flora often contains diagnostic keys. 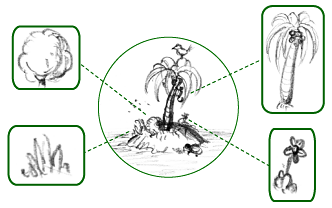 Often these are dichotomous keys, which require the user to repeatedly examine a plant, and decide which one of two alternatives given best applies to the plant. ^ "Merriam Webster Online Dictionary". ^ Clifford E. Starliper; Rita Villella; Patricia Morrison; Jay Mathais. "Sampling the bacterial flora of freshwater mussels" (PDF). ^ John, D.M. ; Whitton, B.A. ; Brook, A.J. (2002). The Freshwater Algal Flora of the British Isles: An Identification Guid to Freshwater and Terrestrial Algae. Cambridge University Press. ISBN 9780521770514. ^ Berrens, Dominik (2019-03-21). "The Meaning of Flora". Humanistica Lovaniensia. Journal of Neo-Latin Studies. 68 (1): 237–249. doi:10.30986/2019.237. ISSN 2593-3019.